Most of us suffer from the occasional headache; whether it is due to dehydration, hormonal changes, sinus or even migraines. According to Traditional Chinese Medicine, the head is where the yang meridians of the arms and legs meet, and the governing vessel which controls yin qi of the body also reach the head. TCM (Traditional Chinese Medicine) regards the head as “the confluence of yang” or “the meeting place of yang”. Moreover, essence and blood of the five zang organs and lucid yang of the six fu organs are all infusing into the head; nourishing the brain and orifices of the head. The head is closely connected with all other parts of the body, and all the organs are responsible for nourishing it. A headache is a subjective symptom and a common pain. It can develop on its own or as a sign of other health problems. Headaches may be caused by problems in the head or elsewhere inside the body. Headaches have numerous causes and can involve different pathological mechanisms. TCM generally classified headaches into two major categories: exogenous headaches and endogenous headaches. Exogenous headaches are associated with external pathogens. An unhealthy lifestyle or temporary bodily weakness can make the head susceptible to external pathogens. These pathogens enter the meridians of the head, interrupt the body’s yang qi flowing upward causing blood and qi stagnation in the head. 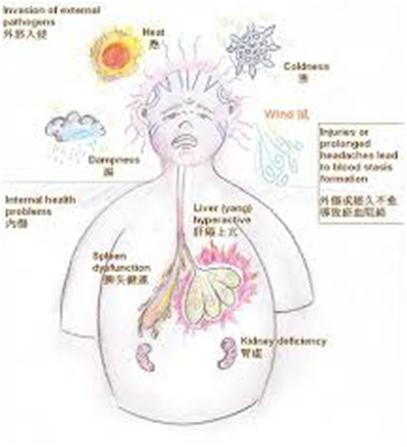 The six pathogens include wind, cold, heat, dampness, dryness and fire. 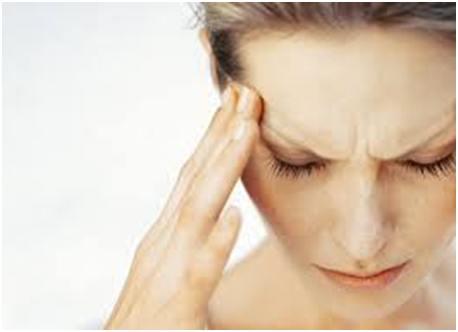 Endogenous headaches are associated with internal health problems. Depletion of kidney essence or insufficient brain marrow makes the head undernourished and dysfunctional. Emotional upsets or stress can lead to liver qi stagnation which will cause liver fire over a period of time. Fire might attack the head and interrupt its orifices. When the spleen is dysfunctional it cannot transform food and drink into nutrient essence. There will be inadequate nutrient essence to supply the head and mental activity will weaken. A dysfunction in the spleen also produces dampness and phlegm that attaches to the head orifices directly. Headaches following head injuries are due to blood stasis formed in the head. The nature of the pain helps to understand the cause and underlying disharmony pattern which in turn will provide guidelines to decide the specific method of relieving the headache. In ancient times, headaches were thought to be the work of evil spirits and rituals were performed to get rid of the evil spirits. Ice cream can give you a headache because it causes the blood vessels in the head to contract and spasm. Tension headaches are the most common headaches and are a result of your neck and shoulder muscles going into spasm. Tension headaches can last for days. Hangover headaches are caused due to dehydration and low blood sugar. Hangover headaches can be cured by drinking large amounts of water and sugared tea. Lifestyle plays an important part in preventing headaches. Exercise regularly, eat healthy meals regularly and drink lots of water and you will find your headaches will reduce dramatically. For more information on how Acupuncture can treat your headaches and migraines, contact me for a complimentary consultation on 076 298 4992 or info@cape-acupuncture.com.